As the events have been heating up and the White House has to wait another 4 years for a constitutional leader, those who are in the White House under the constitution abusing Obama have ignored the advice of the Chairman of the Joint Chief of Staff General Dempsey and are preparing for a strike with cruise missiles against Syria. General Dempsey, the highest in command of the US armed forces behind the President and since there is no constitutional President elected he is the Commander in Chief at least according to every intelligent human left on this planet, has advised against any military action which is being ignored by those who are above him in the decision making process. The US has moved five destroyers into the East Mediterranean Sea armed with cruise missiles which the US plans to fire towards Syria in what they call a precise and limited strike which some analysts predict would consist of striking Syrian military installations with anywhere from 200 to 300 Tomahawk cruise missiles. The US claims that the six war ships are there as a precaution, but the pressing and unanswered question remains precaution to what? The US is under no threat from attack and while politicians claim this is a precaution, the correct term would be that it is the final step for an attack. It makes no sense to place six war ships in striking distance towards Syria. We all know the story from Iraq, first it is a precise and limited air strike, and then a full blown air offensive and later ground troops enter and lose their life for no reason at all. This shows the absolute lack of respect for the lives of our brave men and women who are being send into combat without reason to fight a war which will never been won. After tens of thousands of dead soldiers and a country in ruins the US will go home and be even more damaged on several domestic as well as foreign fronts than before. Sure, right now nobody considers ground troops which brings up the question as of why the USS San Antonio has now joined the five destroyers? 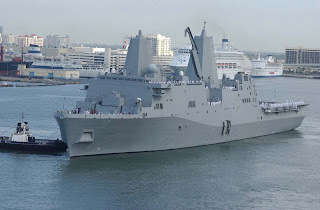 The USS San Antonio is an amphibious transport dock and the USS San Antonio is one of three ships which carried 2,200 Marines and was active in the region. Marines are not deployed for police or occupational missions, they are one of the finest expeditionary forces in today’s military arena and they are trained to go in and fight. Having the USS San Antonio joining five destroyers signals that the US is prepared for more than a cruise missile strike. The good news is that Mr. Obama decided to seek approval of Congress and we can just hope he will get shut down otherwise the situation will escalate. I am headed to another meeting where we discuss how to act in the event the US decides to strike Syria, the fallout and how to protect our business interests in the region.